According to the source, the Avenger, that should be replaced next year, making use of the new Chrysler 200, will have to wait one more year for that. Chrysler group may follow Fiat Europe’s strategy of delaying the arrival of new models waiting for better economic conditions. Even if US car market doesn’t face the difficult times of European one, Chrysler is thinking of extending life of a big part of its current range of products. According to The Detroit News, 3 of the cars that should be replaced in the coming months, will have to wait more time till the new generation arrives. The newspaper refers to the Dodge Avenger, the Grand Caravan, and the Jeep Wrangler. The reason for this surprising decision may be related to the cash needed by the company to face European crisis and complete the purchase of Chrysler by Fiat Spa. However, the company hasn’t confirmed this version yet. The new Caravan would arrive in 2017, 2 years after the initial plan. Current Wrangler would live till 2018. Since Fiat bought the first 20% of Chrysler shares in 2009, the American company has launched only 4 all-new models, the Dodge Dart, Durango and Viper, and the Jeep Grand Cherokee. The company updated many others, but at the end, the range of products hasn’t changed too much compared to the pre-crisis range. Currently there are many models a bit aged that should be replaced as soon as possible in order to gain or maintain market share. Chrysler brand offers 3 models, and the most recent one is the Town & Country, presented in 2008. Dodge’s latest product is the Viper, introduced in late 2012, and before there was the Dart in June 2012, and the Journey, presented in 2009. Jeep launched the Grand Cherokee in 2011, and before that there was the presentation of the Cherokee/Liberty back in 2008. Of course, this analysis doesn’t include the restylings, as these are not considered new generations (not even the Chrysler 200, which is a result of a deep restyling of the Sebring). By the time Fiat arrived in Chrysler life, it was quite understood that new cars had to wait for their release, as the company was dealing with its bankruptcy. 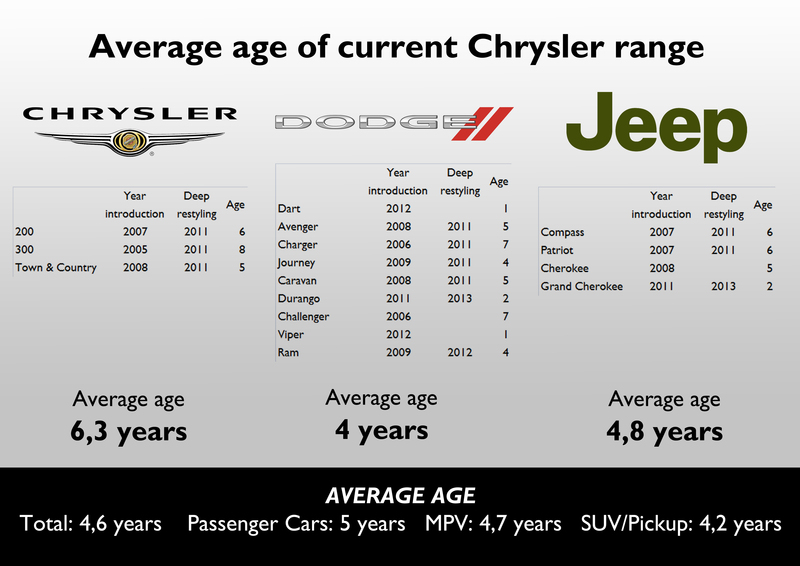 Chrysler’s current range is 4,6 years old, which isn’t a big number, but is not the best either. Notice that the large sedans are the eldest products, with an average age of 6,5 years. But now, 4 years after the successful marriage and lots of profits, it is time for new cars. That’s particularly true when it is considered the good times the US market is having now, and the opportunity Chrysler is losing because of not having fresh products. The group has been able to increase its market share mainly thanks to its SUV/Minivan range. While Ford and GM strengthened their passenger cars range, with the ultimate big sedans full of interesting technologic features and appealing design. That’s why hearing from this source that a new Avenger will have to wait till 2015 for its presentation, reminds me the same strategy Fiat is using in Europe, which may be saving a lot of money, but is forcing it to leave many important segments where it used to be an important player. Chrysler shouldn’t emulate it. You make a good point, Neither FIAT in Europe nor Chrysler in North America should be delaying introductions. This is a time where it’s important to build market share, especially in the US where the market may be peaking (not sure how long this growth run can last). Clearly cash issues are the reasons for the delays, but this will only be exasperated the longer Marchionne delays new models. I would like to also correct you on that under FIAT ownership, only two new models have been brought to market, the Dart and Viper. The 2011 Cherokee-Durango, and i’d add the 2011 300-Charger were models developed before FIAT’s involvement. 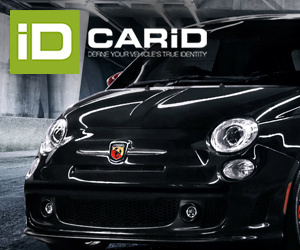 True, they were introduced after FIAT too a stake in Chrysler. Also your average age for Chrysler and Dodge should be adjusted, since the 300/Charger entered their second generation with new models in 2011, the first generation was 2006-2010. Thanks for the precision Bob. You’re right, the Grand Cherokee/Druango were developed under Daimler control, and they were released under Fiat’s. I don’t consider the 300/Charger launched in 2011 as they are both deep restyling of previous existing models. Marchionne’s strategy: no money on new products, only used for finance’s tricks. Now also USA will see true Marchionne’s face. Hello Juan ! please i want to ask you about an invitation to the upcoming Frankfurt Auto show, by the way i’am a fan of fiat group and i have a channle on yotube of all Fiat spa activities . Hi Ans. Let us know your channel. Do you have any invitation for Frankfurt?